Habeeb Bello is from Nigeria. He holds a B.Eng. in electrical and computer engineering from the Federal University of Technology Minna, Nigeria and a Master degree (M.Sc. communication engineering) from the University of Manchester, United Kingdom, in the School of Electrical and Electronics Engineering where he finished with a Distinction, won a prize and was certified as a Keysight RF and microwave student at level 1. His M.Sc. dissertation work was on the ‘Design, Modelling and Testing of a Compact Patch Antenna using the 3D Monolithic Microwave Integrated Circuit (MMIC) Technology’ under the supervision of Prof. Ali Rezazadeh. Habeeb’s acquired degrees and M.Sc. dissertation work have helped him to realize his potentials and the opportunities in the wonderful and exciting field of communications engineering. Modules related to communications, RF and microwave engineering served as a source of inspiration for him and have shaped his thoughts. They not only inspired him to work hard to develop a sound theoretical foundation, but also stimulated him to broaden his understanding of engineering principles especially in the field of communications, RF systems and microwave engineering. 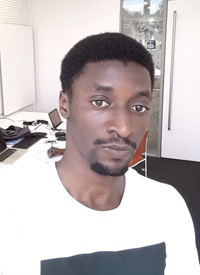 This also motivated and inspired Habeeb to pursue a PhD, which has led to his successful admission and joining of the research group of Prof. Giorgio Leuzzi at the University of L'Aquila (AQ) in November 2016 as part of the CELTA Project, where he is working on the design of a high-frequency oscillator (signal generator) with characteristics suitable for Terahertz (THz) application which will feed an antenna illuminating a sample.